Tenerife has had a jump in popularity with a 14% increase of UK arrivals in May. The UK is Tenerife’s biggest source market for tourism as many Brits go in search of sun and beautiful beaches at reasonable prices for their holidays. The Canary island received a total of 630,418 Brits from January to May 2013, an increase of 1.8% from 2012, according to the Tenerife Tourism Corporation. The south of the island is the most popular, with a total 133,755 arrivals from the UK, but areas such as the capital Santa Cruz and the north of Tenerife have seen increases in May of +27.3% and +2.3% respectively. If you want to visit this summer hot-spot then we have a range of villas to suit many tastes and budgets. 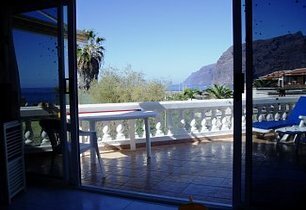 This modern, detached bungalow is situated in the heart of Los Gigantes and has spectacular views of the sea and the Giant Cliffs themselves. Accommodates up to 6 and is in a private position, yet close enough to walk to bars and restaurants so as not to feel too isolated. With availability in July and August and prices from £300, snap it up quickly!